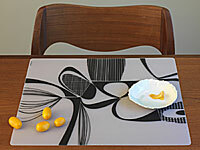 Get a style upgrade with Modern-twist’s silk-screened silicone place mats ($19). Just wipe them clean to keep bacteria at bay. Also, use ’em at home for a chic way to keep kids’ art projects from ruining your favorite tablecloth. Frances A. Largeman-Roth, RD, is Health’s Senior Food and Nutrition Editor. Is Your Workout Messing with Your Gut? This Food Giant is Working Hard to Create "Exercise In A Bottle"